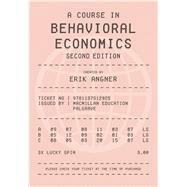 A Course in Behavioral Economics 2e is an accessible and self-contained introduction to the field of behavioral economics. The author introduces students to the subject by comparing and contrasting its theories and models with those of mainstream economics. Full of examples, exercises and problems, this book emphasises the intuition behind the concepts and is suitable for students from a wide range of disciplines. Erik Angner is Associate Professor of Philosophy, Economics, and Public Policy at George Mason University, US, where he directs the undergraduate Philosophy, Politics, and Economics (PPE) Program. As a result of serious mission creep, he holds two PhDs – one in Economics and one in History and Philosophy of Science – both from the University of Pittsburgh. He is the author of the book Hayek and Natural Law (2007) as well as multiple journal articles and book chapters on behavioral and experimental economics, the economics of happiness, and the history, philosophy, and methodology of contemporary economics.